I was watching an Italian cooking show one Sunday afternoon and the chef used a dry white wine from Italy. This reminded me of an adventure I had in Washington. Living in Seattle was one of many adventures my husband and I had. The first place we lived in was a very small studio apartment off of Pike street. What we loved about the location was walking everywhere!! To all these great restaurants one being Terra Plata and all the different shops and nightlife we could find. The drawback to a small apartment is the kitchen. Perhaps those who create small studios think of it as an after thought. There really isn’t a kitchen at all. Both of us enjoy cooking so we had to make do with what we had and I still smile and laugh at the craziness we would go through trying to make dinner. I had found a meal that was considered a one pot meal so easy clean up and shouldn’t need a lot of space. However, I needed a white wine for the recipe; something light, crisp, and dry. I had only brought with me six bottles of wine from my collection and none of them were dry, light, and crisp or white for that matter. Therefore, I needed to find a local wine shop. I had looked in a couple of grocery stores in the area but nothing screamed what I needed. I had seen on google maps there was a wine shop about 1.5 miles from our apartment close to Belltown and south lake union area. I put on my walking shoes, grabbed my timbuk2 cross body bag and headed out the door. Not forgetting the umbrella. Luckily that day was sunny but I know the NorthWest pretty good and at any moment the rains can come down. The shop was very small it seemed. Lots of wine in various places to the point I wasn’t sure it was organized at all to anyone who walked in. Only to the owner or the retail associate. There was an older gentleman sitting behind the counter that also served as a desk and looked as if this was a clear representation of how Einstein’s desk must have looked like. I scanned the space looking for white wine and decided this was going to be useless. I politely asked the gentleman if he could recommend a dry white, light, crisp wine. Something I could cook with but also enjoy with the meal. He smiled and asked if I preferred a region which I did not just as long as it was reasonably priced since some of it was going to be used to cook with. 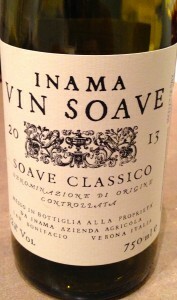 He pulled out of a crate: Inama Vin Soave Classico 2013 from Verona Italy. I was very pleased with the selection. I had a chat with him for a bit and purchased the bottle for only $15.00. Not bad and I was able to excise in the process. I put the bottle in my Timbuk2 bag and proceeded home to fix the one pot dish. 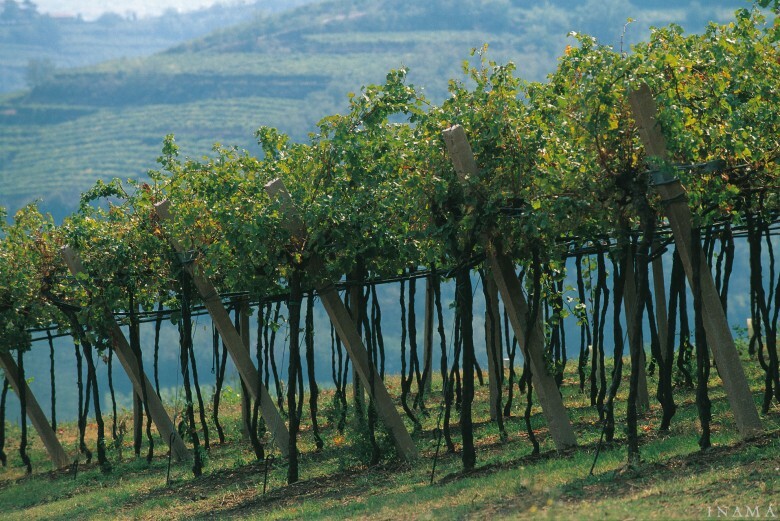 There are so many different varietals used in Italian wines as well as so many different Italian wines!! I have a hard time keeping track. This wine uses the grape Garganega and is fermented in stainless steel, no oak contact. This wine was lovely. Went well even with the fall season. I recommend putting the bottle in the fridge and pulling it out pouring a glass and letting that sit while you cook dinner. The wine doesn’t need to be cold in fact it masks a lot of the flavors. The wine should be cooled not room temp or warm. Taste: A bit like an Italian Pinot Gris; Lemon mixed with floral notes of rose hip, mineral, almond, and crisp dry clean finish. Very easy but complex. I highly recommend this wine paired with a light meal or drinking on the deck in late summer. Cheers!